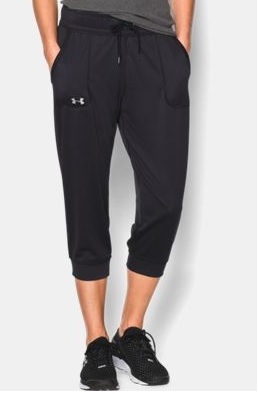 Whether I’m driving the kids to soccer/basketball/wrestling, on the sidelines coaching lacrosse, making crafts with my Girl Scouts, or hitting up Wegmans, my new go-to, perfect for everything pant is the Under Armour Tech Capri. This sporty bottom is great for anyone who is constantly on the go. The UA Tech Capri is truly the most comfortable pant I’ve ever worn, and I wish I had one for every day in the week (but for now I’ll settle for the two pairs I currently own). Fits true to size.